The 30ml (23 day) Dietary Plan Spray Buddy Kit is discounted and ideal for those wanting to share the journey, but living separately. Sharing the weight loss journey helps you stay focused even if you live in different households. Two 30ml premium grade diet sprays, sufficient for one 23 day program each. Two user manuals. Perfect for the first time users. This quantity is generally sufficient for a weight loss of up to 7kg. Results may vary. This unique, quality bioenergetic / homoeopathic multiple homaccord has been carefully formulated in an Australian laboratory to facilitate exceptional outcomes in fat metabolism and weight management strategies. 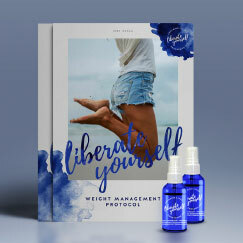 Packed with useful information, answers and inspirational quotes, the Liberate Yourself user manual includes a personal goal setting journal, calorie counters, daily weight record holders and weekly measurement charts. It incorporates our long term experience, additional explanations and solutions addressing individual's experiences, extra necessary information for women, and specific lists of acceptable foods for all parts of the journey to make the weight loss experience a comfortable and correct process.